This my trip report the week before Fraser Island Clean up which I have posted separately. A mate and I were headed north for a week of sun, fun and adventure. 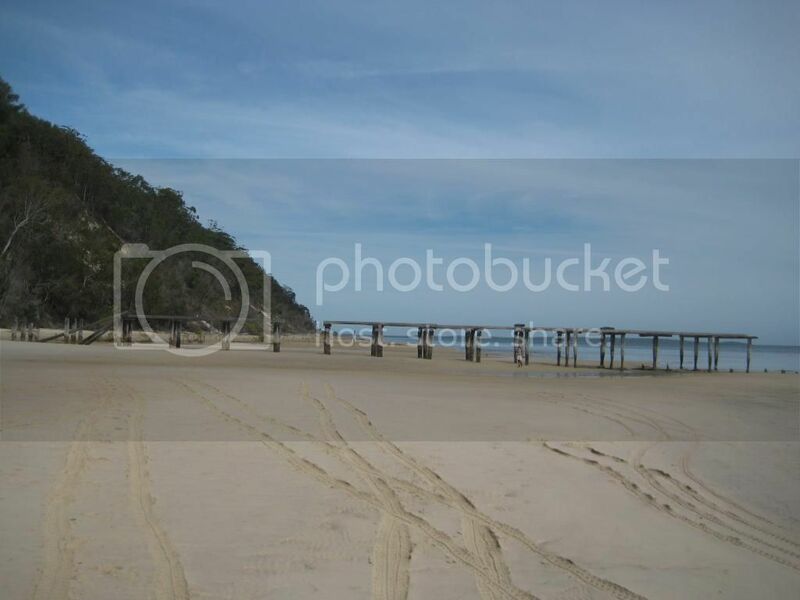 We were headed to Fraser Island, the largest sand island in the world. Kent, a great mate who drives a 1998 Jeep Cherokee met up at my place 2pm Saturday afternoon as I’m throwing the last of my gear into the mighty Jackaroo. 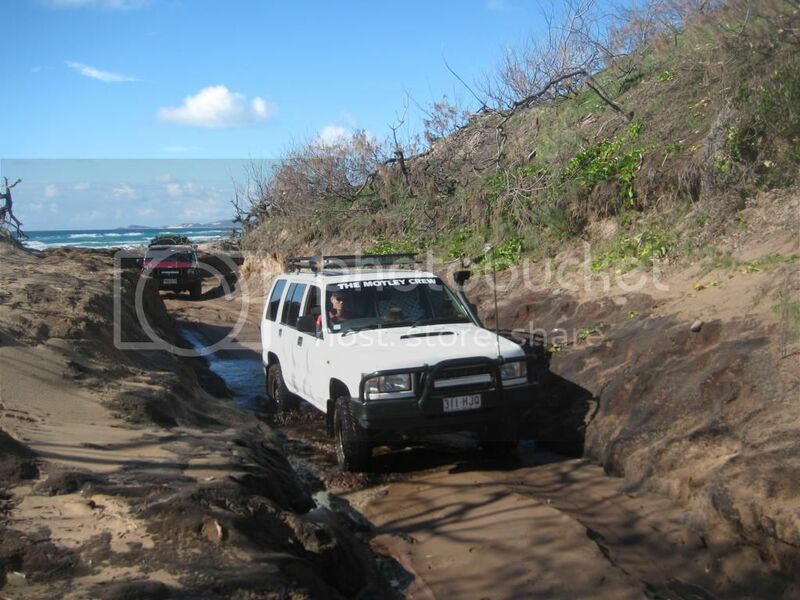 Our plan today is travel at Jackaroo speed to Inskip Point to camp overnight at Inskip point so we can catch the early barge to Fraser Sunday morning being favoured with a low tide at 5am. The travel north was uneventful, Bruce Highway to Gympie turning onto Tin Can Bay Road arriving at Rainbow Beach by 4.30pm. 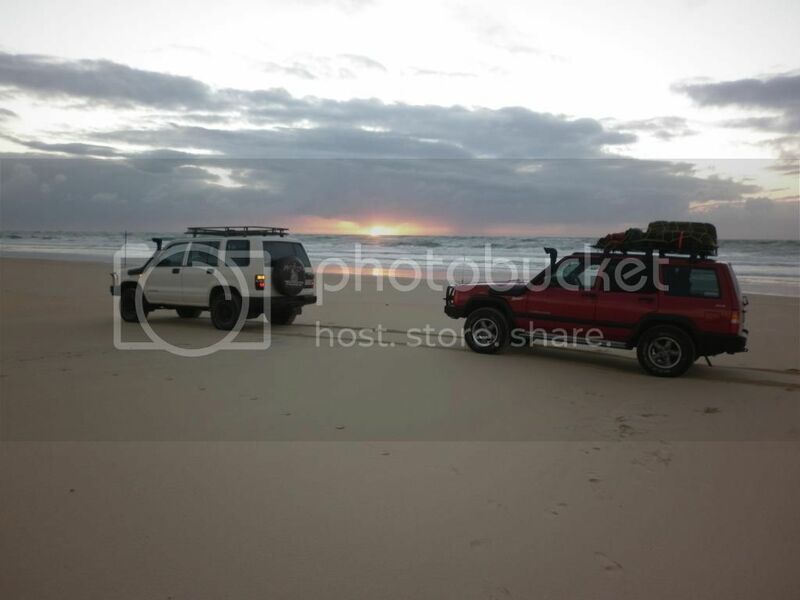 We both fuelled up at the Shell and headed out to Inskip Point to find a site to camp. It was decided to camp as close to the barge as possible so we found a spot at MV Sarawak. Being a weekend there were a few happy campers already camped but lo and behold who should call up on the UHF but Poncho. He was to meet up with a mate of his who had not arrived and having seen the mighty Jackaroo pass by decided to join us and camp with Kent and I. By now it was getting dark after rolling out the swags and we had decided to head back into Rainbow Beach to grab a counter meal at the Surf Lifesaving Club. Kent drove into town, we ordered our meals, and had a few beers. We arrived back at camp by 8pm and after some big stories and plans we all turned in after the generators were turned off. Poncho was the first to stir, quietly packing up and on the road by 5.30pm he was headed back to Woodford to attend the Motley’s Belthorpe Forest run. We decided to pack up and as we were I watched the barge make its way up the passage from Tin Can Bay. It was a still calm morning with a few scattered clouds. Once we were packed and aired down, we headed out to the barge. I had pre paid online for our tickets so we did not pay the ferry man as we had the barge to ourselves. It was an easy passage across to the island and up the beach just in time to catch a sun rise from the beach at Hook Point. Our plan was to drive to Dilli Village and head inland to the southern lakes via Birrabeen Rd. This was an easy drive and we arrived at Lake Boomanjin by 7.30am, Brekkie time. There is a fence hiker’s camp located here so we stopped for a hearty cooked breakfast. Lake Boomanjim is the largest lake on Fraser, is tannin-stained but still a very beautiful place to stop. By 9am we were packed and headed off to Lake Birrabeen, a twin lake to Lake Mackenzie. Even with the inviting clear waters of the lake, it was too cool for a swim so we left that to the few European back packers who had braved the early morning chill to swim/bath here. Our journey continued to Ungowa on the western coast via Ungowa Rd arriving here at 11am. There are a few structures from yester year still in place here. 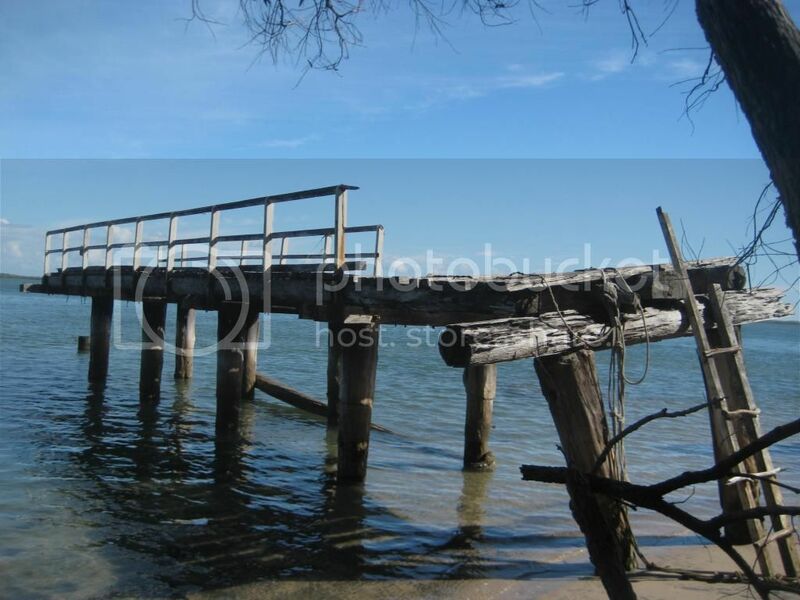 The old jetty is all but standing; a wooden loading ramp and boat shed tell the story of bygone industry. 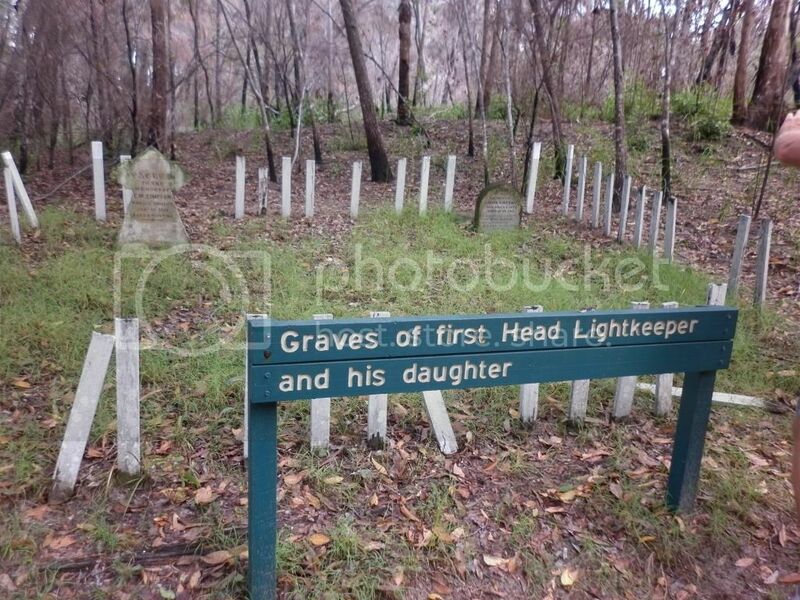 Qld Forestry Service was based here. There are plenty of mosquitoes and sandflies here. We continued to travel south from here heading to Gary’s Anchorage named after a local indigenous tracker Gary Owens . 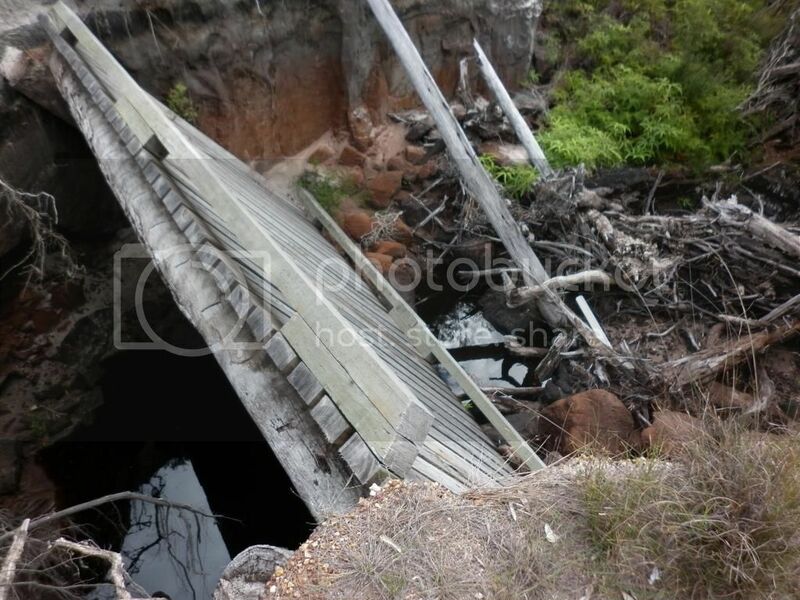 It is a long slow drive but full of discoveries, washed out bridge, gravel road. We could get phone reception here both being with Optus, I gave my family an update from Buff Creek. Continuing on we got to the bridge at Deep Creek which had been washed out, thankfully we were able to by pass and made Gary’s Anchorage for lunch at 1pm. It is a safe anchorage for boats and full of mosquitoes. On our return journey we stopped in at Deep Creek to find the ruins of the old timber loading jetty used by the Mackenzie’s mill to load timber cut from the island. 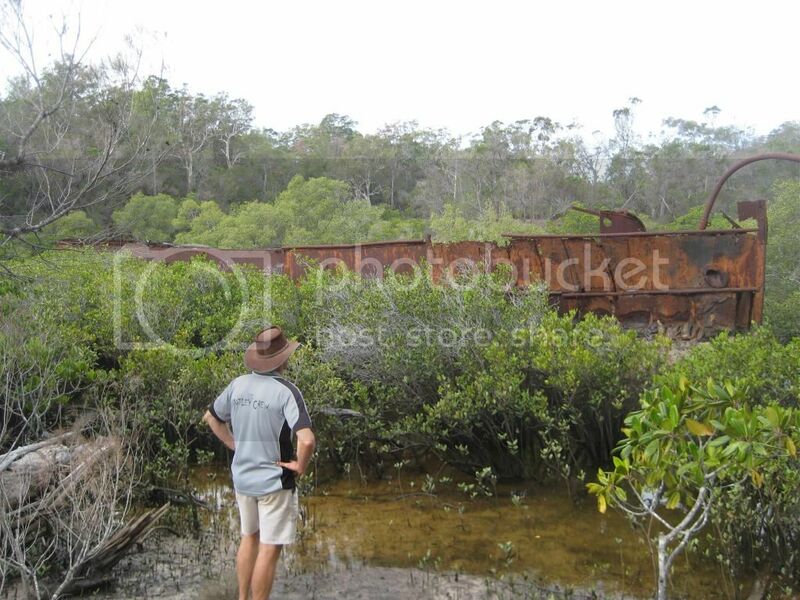 There are also 2 rusting timber barges beached here and slowly being overgrown with mangroves. This side of the island obviously had an industrious past being closer to the main land. From here it was an easy run back to Ungowa then onto Central Station where we would camp for the next 2 nights. We arrived there at 3pm, found an open site to get both vehicles onto and set up camp. This is a well serviced camp ground with facilities for hikers, tents, and camper trailers. We walked the Wanggoolba Ck broad walk and planned tomorrow’s walk out to Lake Mackenzie via Pile Valley and return via Basin Lake. After dinner we turned in at 7pm, it had been a busy day. Being in amongst the trees it gets dark early and cools down quickly once the sun is gone. Awake at 6am, it is still quite dark but the birds have stirred and can make quite a noise. We get breakfast done and having hard boiled 2 eggs to take for lunch today on the hike, I leave them on the stove grill to cool. I turn my back to clean my teeth and return shortly afterwards to find both eggs gone. There is only a small amount of shell remnants on the ground but 2 very satisfied crows preening themselves, so much for eggs for lunch today. It is a fine morning with a few scattered rain clouds lurking so we set off walking at 7.30pm.The walk is very easy with graded tracks mostly using where the old tramway tracks were laid. Unfortunately, already carrying an injured knee, I tripped and twisted it badly and was only able to hobble the last kilometre to Lake Mackenzie. The water at the lake was very soothing for my knee but I would not be able to make the 7km return walk via Basin Lake. I stayed at the picnic ground while Kent was able to carry on. Kent started back at 11am and made good time to be back by 1.30pm with the Jeep to give me a ride back to camp. I was disappointed + frustrated but could only listen to his story of the return trip. 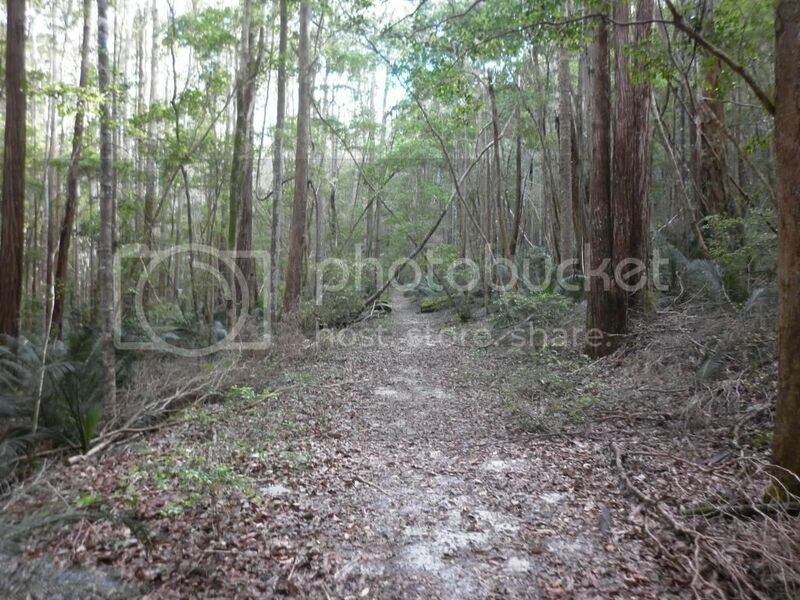 The track back was much shorter but in places was overgrown and undulated, with some steep sections. I needed to rest back at camp, took some drugs and strapped my knee. We had planned curry and rice tonight, but once again, while our backs were turned the crow got the rice and spread it on the ground. Curry with bread rolls was still very filling and the crows ate dried rice. We decided that 7pm was too early to go to bed so we drove back out to Lake Mackenzie to try and get a moonlight picture over the lake. Driving at night we were able to see more wildlife, bandicoots, dunnarts, and owls. Arriving at the lake was very eerie and dark because it was overcast however we took few pics over the lake. Once we got back to camp there was light drizzle so we hit the hay. After a good night sleep my knee was swollen but not as sore. After breakfast, we packed and got underway by 8am. We headed to Mackenzie’s Jetty via Bennetts Rd. Along the way we stopped at the mission ruins but were unable to find the site so we walked onto the Z force Commando site used during WW2. 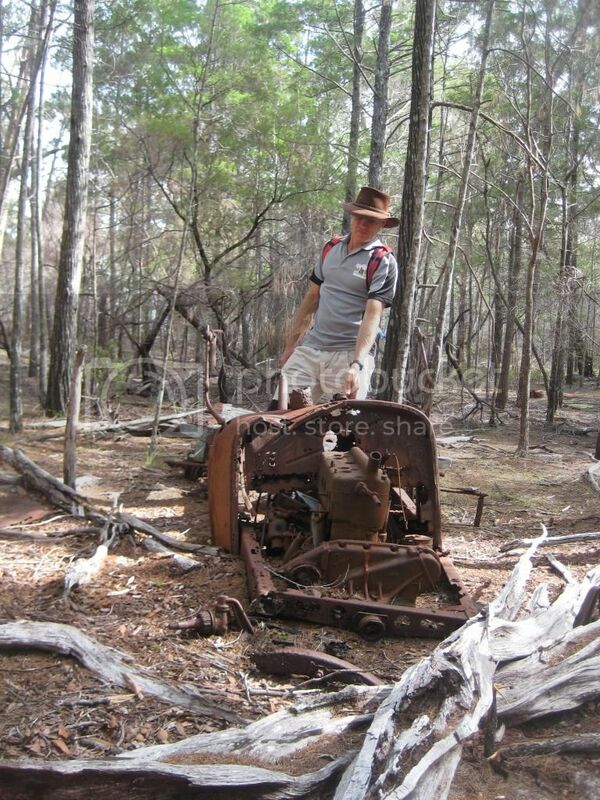 There are a few rusting vehicles and concrete slabs left here after the site was abandoned in 1945. This training camp was top secret with some 900 men being trained for special ops during the Pacific campaign during WW2. It was an easy walk from here to Mackenzie’s Jetty used during the logging years by Hepburn Mackenzie to load milled timber from the island. The mill was closed in 1925 and little remains on the site today. 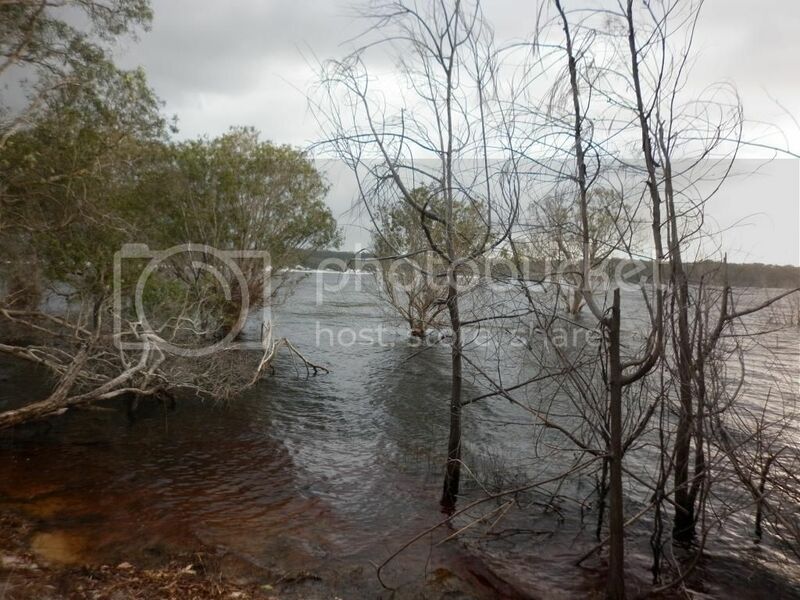 From Mackenzie’s Jetty it was an easy drive to Kingfisher Bay Resort. 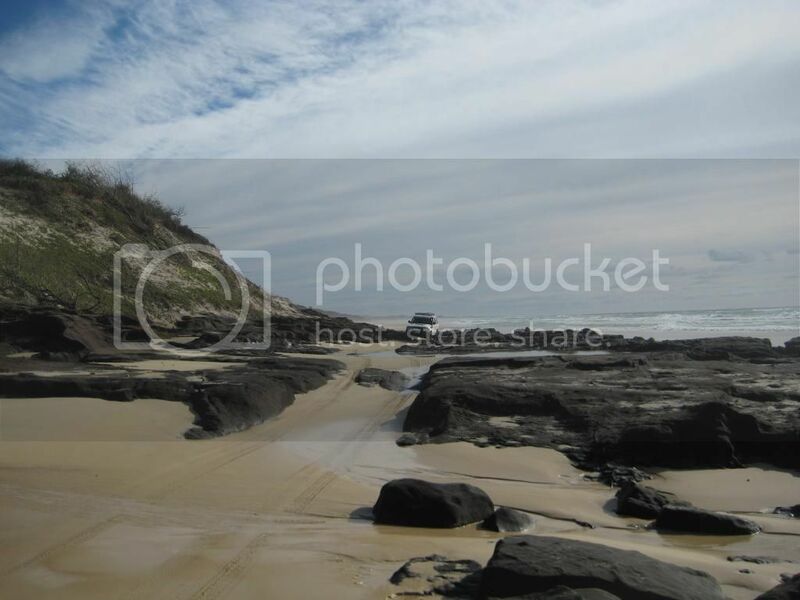 I must say that I did not come to Fraser Island to see a resort but it is very impressive and would love to stay here one day just for the pleasure and comfort. After we had walked the jetty, it was time to go so we drove toward Lake Wabby via Bennetts Rd. We stopped at the lookout for a pic then walked the track down to the lake. The track was steep but only a short walk to the lake. The sand blow is very impressive and you get a feel for its size as you walk at its base. The lake was cool and being sunny a quick swim was refreshing. After the lake we headed via Cornwells Break Rd to the beach and headed north to Happy Valley Resort. We stopped in to check on meal times. It was necessary to book for meals because the cook only wanted to prepare limited number of meals. We booked for 6pm and decided to find a beach camp for tonight. Some of the areas were closed so we headed north to Wahba Camping Zone just north of the Maheno wreck and set up for the night. It was about 4pm.when we got to camp. By 6pm we arrived back at Happy Valley resort to have a beer and chat with a local at the bar. He told us of the old logging camp ruins at Postan’s Rd which sparked some interest. We also were interested in the Valley of the Giants drive so plans were made to do the trip tomorrow morning. Back at camp there was a light drizzle but we were all set up so it was lights out at 8pm. Day started with the bird calls, overcast with a light breeze, we packed up with intermittent showers. The day looked bleak but we had decided to go west again to check out the logging camp ruins. We headed south to Poyungan Valley and turned off the beach onto Postan’s Rd. This took us to management track which was gated but others had driven around the gate which we did also. We had driven a short distance to find a sign saying a historic site and there in amongst the trees was an abandoned logging camp with numerous machinery pieces in different amounts of dis-repair. There were engines, gearboxes and tires scattered over the site. Several shed were still standing. 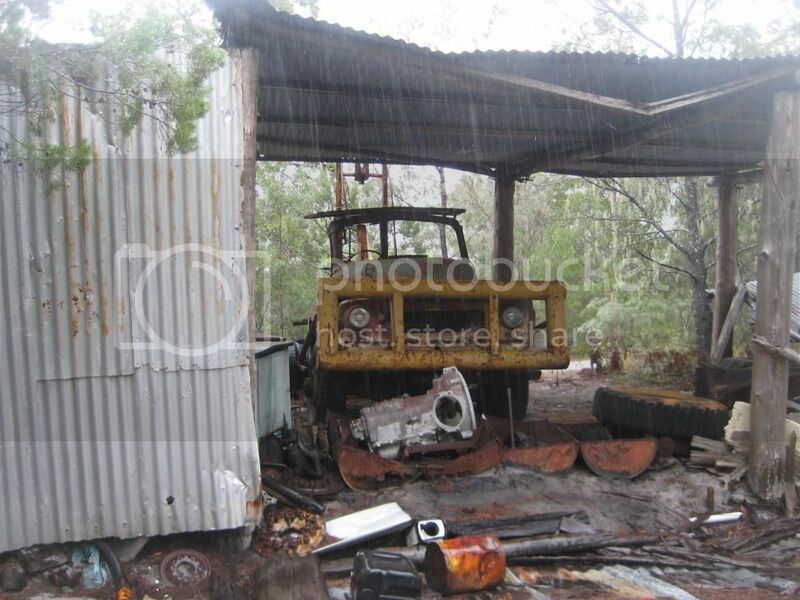 By this time the rain was heavier and the sheds were still dry inside. There were several dwellings still standing with asbestos warning stickers. The old tank stand, toilet and shower still place. The camp was abandoned in 1992 when all logging cessed on Fraser, now the timber was slowly swallowing up the camp. We decided to follow one of the tracks from the camp west toward the water. 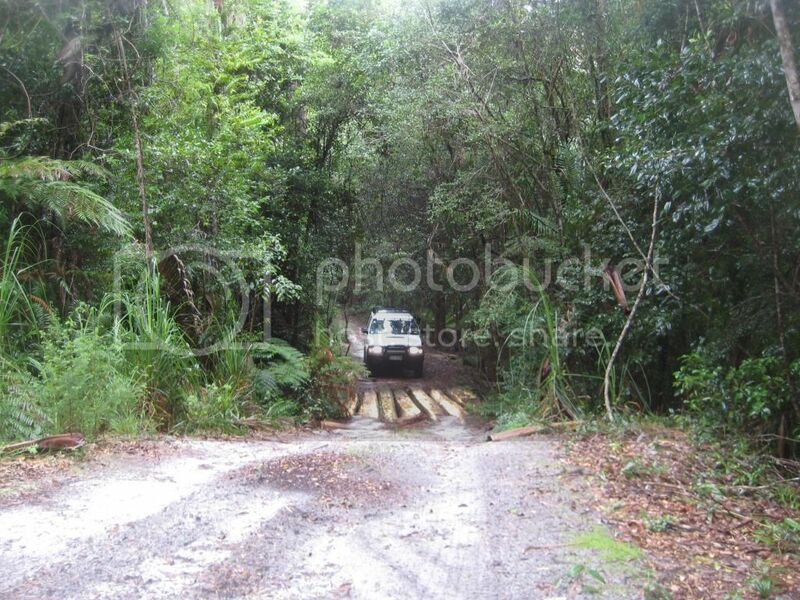 It was very overgrown but we managed to get the vehicles through to find an abandon loading site on a small creek. Once again there were plenty of mosquitoes here. We just back tracked from here to find the Valley of the Giants turn off. 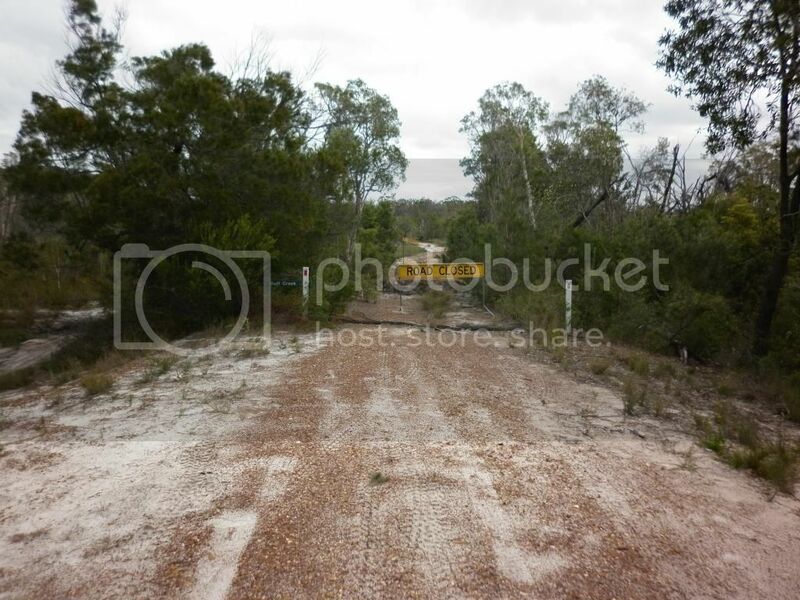 This is a lop drive thru a regrowth area of large Tallow wood and Satinay trees. There are many trunks with up to 11m girths. These giants would have been originally felled by hand, no small feat, dragged by bullock teams and loaded onto the railway trolleys to be hauled to the coast. 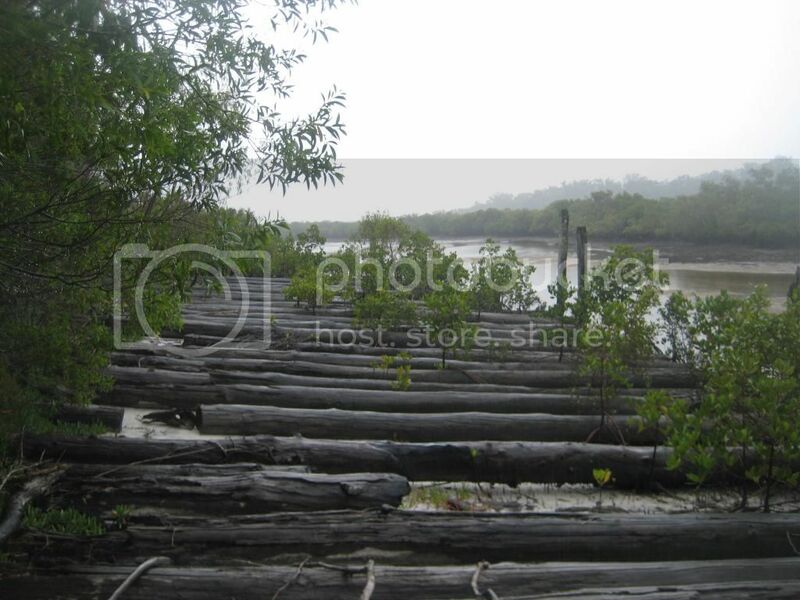 Originally the logs were packed together and floated as rafts to the mainland but later were loaded onto the logging barges and taken to Maryborough. These trees create a rainforest environment which you would not expect on a sand island. It was a very pleasant drive. From here we could only back track back to the beach and head north to Happy Valley. By now the Jeep was running on fuel tank vapour so we drove into Happy Valley to refuel both vehicles, cost of fuel was $2.20/L. We had lunch here. The rain had stopped but it was blowing + overcast which made it quite cool. We stopped at Eli Creek to check it out and even the back packer were not swimming and those that did where blue. We continued north to Waddy Point which was our planned destination tonight. We camped on the beach side at Waddy Point so we could have a fire here and shower in the fenced camp ground. There were some larger logs other campers had left in the fire rings so I split them and got a fire going. I made a beer damper in alfoil which was not too bad for dessert and so ended another day. During the night there was a heavy down pour of rain. 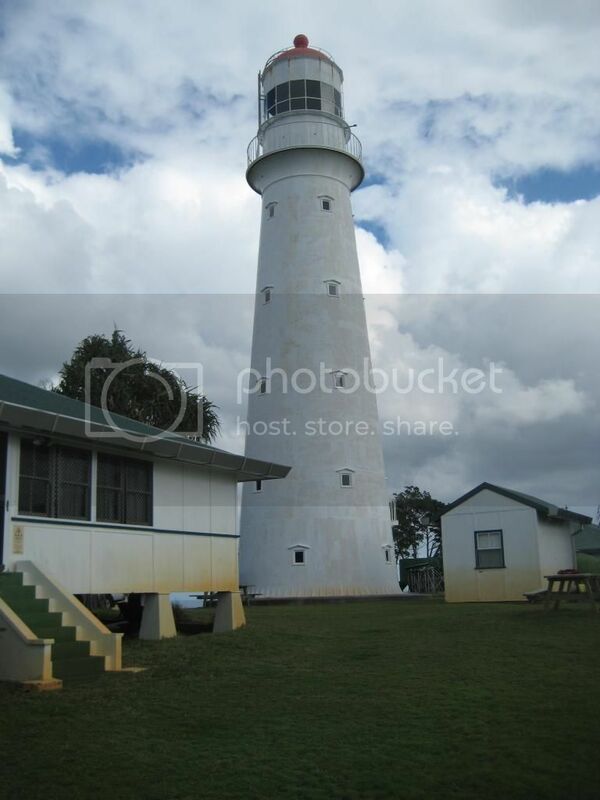 When we spoke to the keeper at Sandy Cape lighthouse he said that they had 40mm there over night. The swags were wet but we had remained dry inside. It was sunny this morning so we delayed pack up to give the swags a chance to dry. By 9am most of the swags were dry so we packed up and started out for our final destination, Sandy Cape. The bypass at South Ngkala rocks having a small muddy hole step up had changed a lot since I was last here in 2010. North Ngkala rock where I got hung up in 2010 is now all but covered with sand. The run to the cape only taking us an hour. There were a few fishing but none had caught much. We drove to the lighthouse gateway. The walk up to the lighthouse is steep with an uneven board walk but worth the effort. The lighthouse was set here in 1870 and still light today with solar power. There are volunteer light house keepers who keep the grounds and provide info for the weather bureau; they work on a monthly rotation. The lighthouse is due another fresh coat of paint in the coming months. We also walked to the graves of the first lighthouse keeper and viewed the ruins of the bunkers used during WW2 when there was a radar base here. By now it was lunchtime so we decided to find a spot in the camping area and settle in because Kent was going to catch fish for dinner. Having broken 2 fishing rods from the overgrown tracks on the western side of the island, Kent was able to resurrect 1 fishing rod. Now to find some bait, the only pippies we could get were no bigger than a finger nail, so fishing never happened. It was good we had some pasta, eggs and bacon. While out fishing, let’s call it that, the water was so clear, I saw a small turtle and a sting ray in a wave. The waters up here are quite spectacular. We camped in the Carree Camping Zone near a permanent commercial fishing camp which was not occupied at the time. There were large numbers of flies here which were not repelled by the Bushmans. I was able to set up my camp shower which I wanted to try having made some improvements. It was a beautiful afternoon at the top of Fraser Island. There was a light drizzle in the evening as we ate our scrambled egg pasta, Manu would have given us 8/10. nice read Ian...after reading that i think we'll head over to Fraser next year for a 2 week stay at some stage, we haven't done that for a while now. The boss keeps saying we need to go back there again, so reckon we will and go see some of those places you went to in the report, as i haven't been to many of them even though we've been to Fraser a heap of times.